Explore endless possibilities for pristine, stunning, panoramic and intimate landscape imagery right from the roadside and from short hikes into the backcountry. We take you and your group to places in Alaska where we know the lighting and seasonal conditions intimately – locations we’ve explored and photographed for years that have yielded successful commercial or personally rewarding images. 1. Complete the form found at the “Book AK Private Tour” button above with your preferred tour dates to verify we have no other conflicts on your desired date(s). Southcentral Alaska and the Kenai Peninsula are target rich areas. There are endless possibilities for pristine,stunning, panoramic and intimate landscape imagery right from the roadside and from short hikes. This amazing and varied landscape is unique from other mountain locations with the presence of landlocked and tidewater glaciers and icebergs that are accessible. In addition, wildflowers, waterfalls, lakes and reflections, rainforest and marine environments are in abundance. Due to the high latitude, learn to capture the magic of northern light. 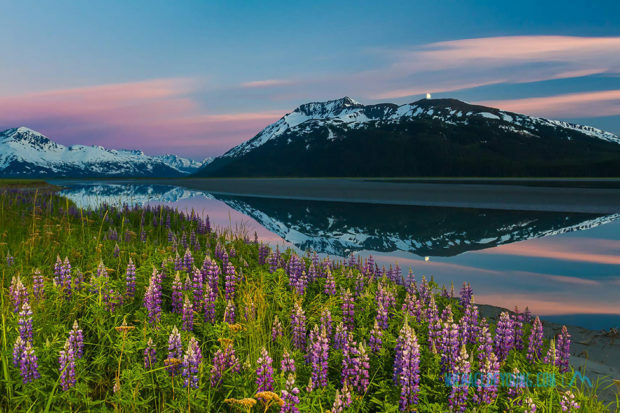 June and July are prime months to capture the wildflowers and snow-capped peaks while mid-August through September are great for fall colors and Northern Lights (aurora borealis).